If you've ever dieted, you've undoubtedly worked very hard to achieve results -- only to experience the disappointment of having the pounds creep back on. But what if losing weight didn't have to be difficult? Now wellness expert Kathy Freston lets you in on her secret. 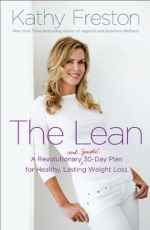 With this book she shares the powerful concept of The Lean -- a radically effective approach to positive change -- with an incredibly easy 30-day plan to transform your health. You can jump-start weight loss in the most gentle and automatic way possible. In fact, it can be fun -- yes, fun! "Leaning in" is about setting an intention for what you want, and then nudging yourself ever so gently in that direction, even if getting there seems impossible. It's about making choices to eat foods that are delicious, filling and supportive of your weight loss goals. All you need is the willingness to take just one step. As you add the healthier foods to your diet, eat the new foods first. By gradually adding in these nutrient-dense, fiber-rich foods, you'll simply stop feeling cravings. On Kathy's Lean plan, you can experience ongoing, healthy, and permanent weight loss -- plus more energy, improved digestion, clearer skin, and a renewed sense of purpose. Complete with more than 45 recipes, and grounded in the latest science and research, this breakthrough book reveals the missing link to weight loss that you've been waiting for. The Lean offers a path to truly leaner body -- and the inspiration we all need to achieve lasting change.